The AKG Perception Handheld Wireless Vocal system delivers brilliant sound and is surprisingly easy to use. The SR45 receiver provides professional XLR and 1/4 inch jack outputs. The audio level and squelch threshold are adjustable on the receiver. 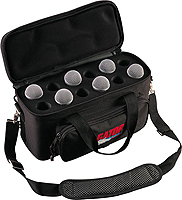 The handheld transmitter features a spring-steel wire mesh front grill to protect the dynamic transducer from the hardships of onstage use. Its cardioid polar pattern ensures maximum gain before feedback and makes your voice cut through any mix. The system includes an SR45 receiver, HT 45 handheld transmitter, universal power supply with US/UK/EU adapter, SA 45 stand adapter, and one AA size dry battery. 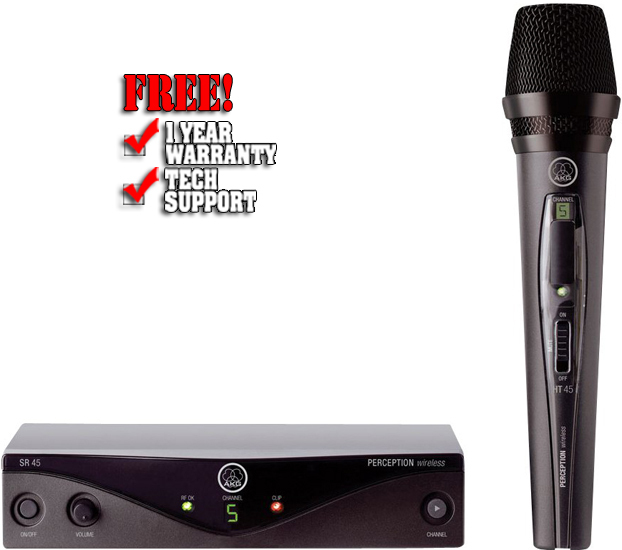 The Perception handheld wireless microphone system comes complete with bandwidths up to 30 MHz and excessively low-current transmitters, which are unique in its class, cementing Perception Wireless as one of the most comprehensive systems in its price range. The Perception Wireless is designed to accommodate musicians and entry-level audio technicians, although it has the capabilities to handle even the most difficult audio setups with up to 8 channels per band. The HT45 Handheld Transmitter, also running on a single AA battery, gives users the ability to adjust the microphone level from high gain to low gain and comes with a capsule from the Perception Live Series protected by a rugged wire mesh cap. The SR45 Stationary Receiver delivers a diversity system, professional XLR and Jack outputs and the SMPS solution. "Increasing ease of use with perfect audio transmission was the target for this new wireless microphone system," said Thomas Umbauer, AKG's Product Manager for PPA. "Perception Wireless is tailored to your needs, from single-channel applications and individual configurations to multichannel systems. The Vocal, Instrumental, Presenter and Sports sets are the ideal plug-and-play wireless solutions for musicians and small installed sound venues."